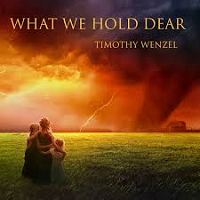 What We Hold Dear is the sixth solo album from composer and keyboardist, Timothy Wenzel. Comprised of twelve new age / contemporary instrumental pieces, Wenzel is once again joined by the talented violinist Josie Quick on most of the compositions, whose signature instrument and style of playing is an integral part of the soundscapes. Additionally, Jordan Schug plays cello on several pieces while Corin Nelsen mastered the album. Much of Wenzel’s music possesses a notable Celtic bent, while drum machines provide gentle backing rhythms on most of the compositions. “Murmuration” opens the album with a softly elevating ensemble of cello, violin and keyboards that highlight a continuously flowing piano riff throughout, effectively recalling that of a horse and carriage riding along through hillside meadows. Conveying a mood that is gently uplifting yet peaceful, the rest of the album mostly follows in this mode, often noting the changing seasons and shifting landscapes of which Wenzel’s music largely conveys. One such example is “A Spring Day in Autumn”, an especially lovely piece and easily my favorite on the album. A violin enters accompanied by piano, where they’re soon joined by harpsichord and Celtic flute. Lending a distinct medieval or renaissance flair, the piece seemingly evokes images of a majestic castle in the mountainous mists. Also notable is the nocturnally alluring “Incantations”, which opens with a solemn cello juxtaposed with sparkling piano, as the piece gradually builds into a steadily rhythmic ensemble of violin and keyboard textures. The somewhat fantasy-like “Desert Dream” is another favorite, which opens with more classical-nuanced piano and Celtic flute. A pairing of strings underscored by subtle marching rhythm soon enter, as wordless soprano vocals courtesy of Sarah Joerz hover above the arrangement like an emerging angelic presence. The closing piece, “Turquoise Sky, Emerald Sea”, aptly conveys that of sailing across a calm sea on a sunny day, gently guided along by leisurely strumming guitar and a keyboard arrangement that places distinct melodic emphasis on the violin. Often simultaneously evocative of the ancient British Isles and rural North America, What We Hold Dear is another satisfying offering from Timothy Wenzel that will appeal to many fans of Celtic, new age and contemporary instrumental music. Although his compositions tend to convey a similar feel to one another without expressing a whole lot of emotive range, his musical outputs are consistently lovely, always lending comfort, joy and peace with every listening experience!